Welcome to the CIT Printing Section, to begin printing your documents, just log on to any of the computers in Open Access or the computers in all the IT labs. After logging on, open up your intended document you wish to print, click FILE on the top left corner of the screen and follow the instructions below. There are two types of printers, colour (CIT COLOUR PRINTER) and black & white (CIT MONO PRINTER). 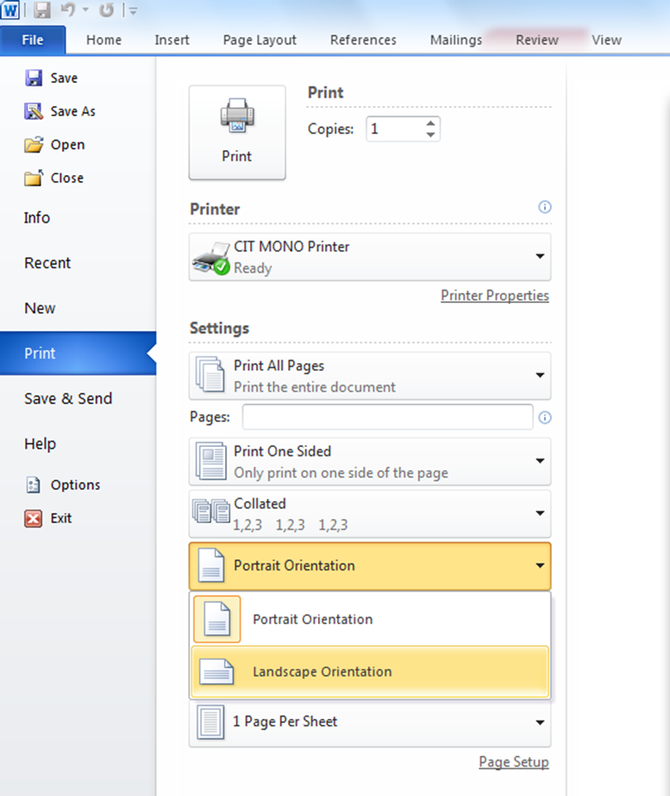 To choose which specific printer you want to use, click on the arrow underneath Printer and select either MONO or Colour as shown below. Above the printer is Copies where you can tell the printing stations how many copies of the document you want to print. 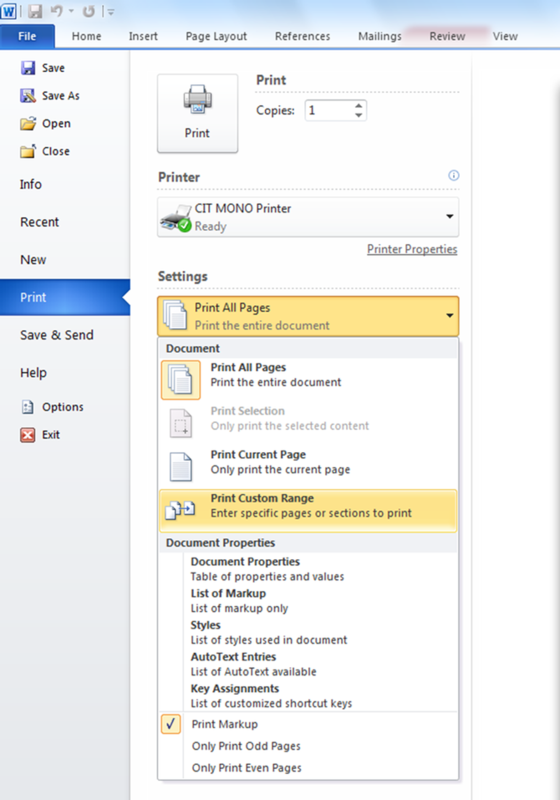 If you only want to print specific pages, go to settings and choose either Print All Pages, Print Current Page and Print Custom Range. 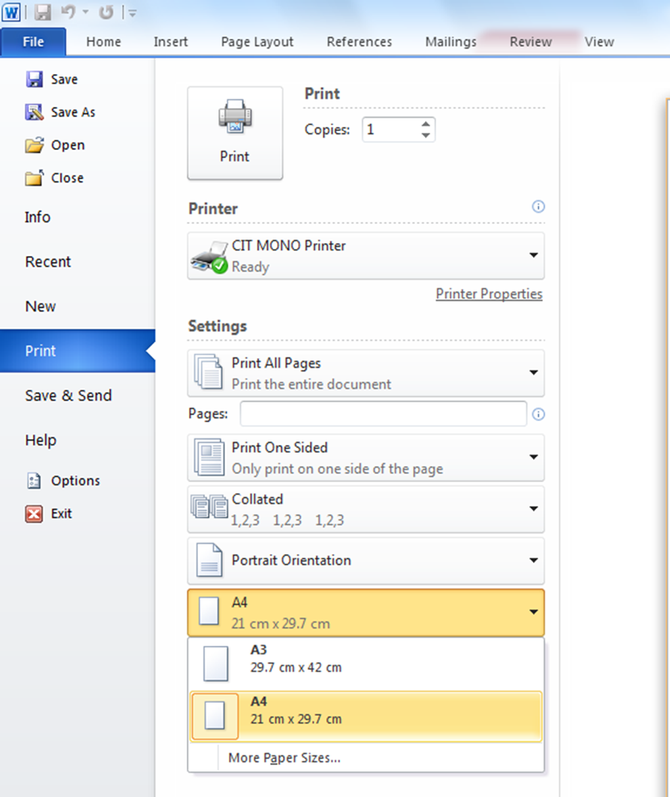 When choosing Print Custom Range, you need to enter the range of numbers inside the Pages box. 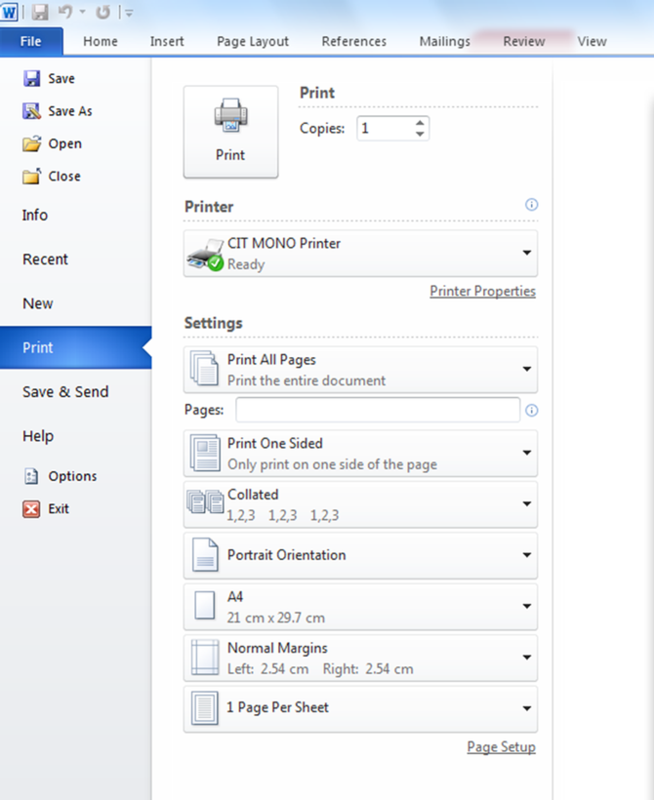 So for example, you only want to print page 6 to 12 out of a 20 page document, you type in 6 - 12 inside the pages box. The printer will then print them selected pages. You can choose to print your content on one page at a time or print on both sides of a page. Where you can set your pages to be portrait or landscape. Printers have two types of paper to choose from, A4 (medium size) and A3 (large size). In the printer section, you can choose what size paper you want as shown below. After setting up and accepting the print settings, your document information will be sent to the printing stations outside of open access. The information will be sent after you select Print. To begin the actual printing, go to the Copy & Print Stations as pictured below. 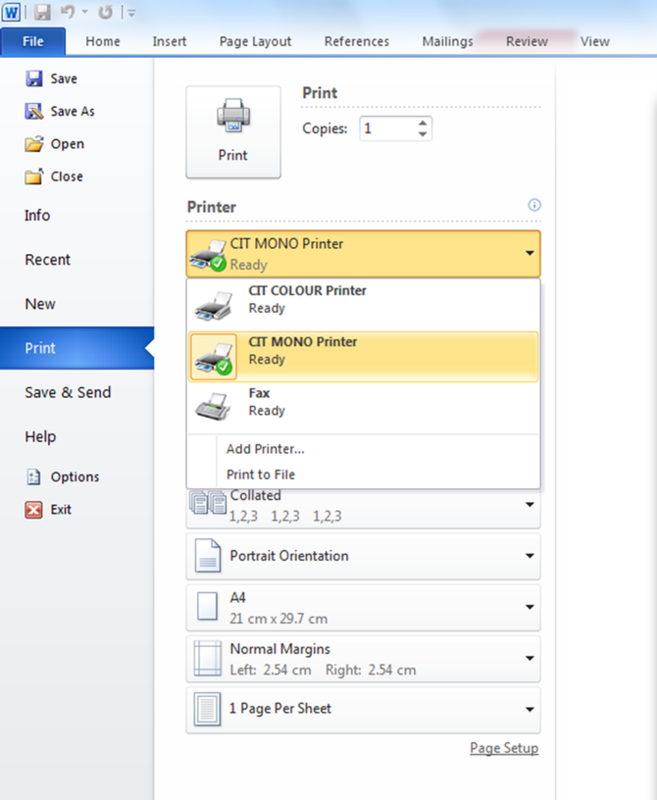 As mentioned before, there are two types of printers which are MONO(black& white) and COLOUR. Go to the designated print station. Follow the options on-screen to print the desired print job. You are only charged for a print job once it has physically printed. If you don’t print a job within 24 hours of first submitting it, then it is dropped from the system and you need to start again. 1. 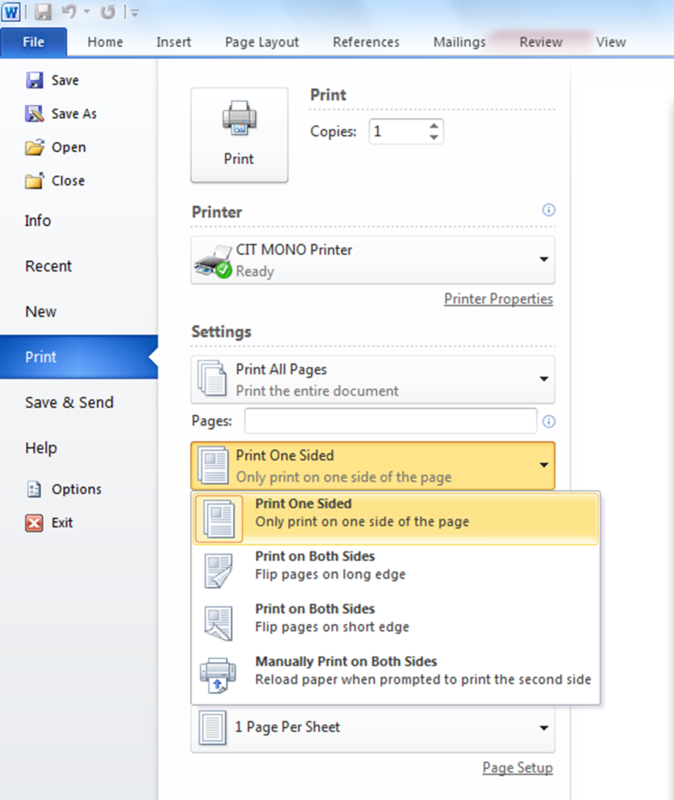 When you wish to print from the computer you are using, open the relevant file for printing and select File - Print. 2. Select the print ‘queue’ you wish to print to, depending on whether you wish to print in black and white or in colour. 3. After sending your print job into the print ‘queue’ you can then go to any Datapac MFD. 4. At any Datapac MFD touch your college ID on the card reader. 5. Select “Pull Print” on the touchscreen and select the job you wish to print. Please Note: If the nearest MFD is unavailable, or should you wish to print at a later point in time, you can carry out these steps from any available MFD. When photocopying or scanning large numbers of single sheets, you need to log into the Datapac MFD as normal, place the document for photocopying or scanning on the top feeder, face up, and press the copy button. 1. At any Datapac MFD tap your college ID Card on the card reader. 2. Select “Copy” on the touch screen. A. You can select if you want Black & White or Colour output. B. You can select to copy to single-sided or duplex output. C. You can reduce the size of the original document, for example to fit an open book onto an A4 page. 2. Touch “Scan to Email” on the touch screen. 3. Follow the options on screen to have a scan sent to your email address.